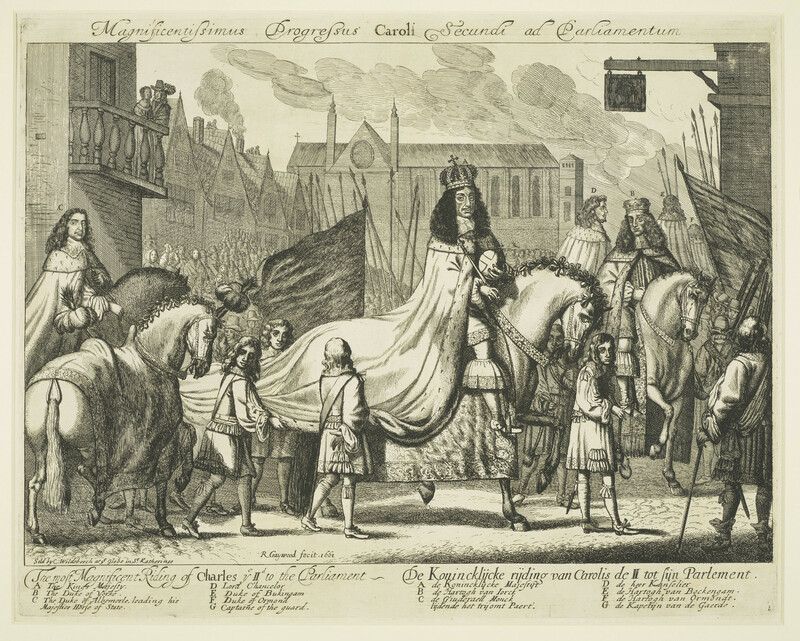 This etching shows Charles II and his retinue riding past Westminster Abbey on the way to the State Opening of Parliament, two weeks after the coronation. It captures the great public interest in seeing the newly crowned monarch, with spectators filling every available space- standing on balconies and even scrambling onto rooftops. It may be based on a design by Francis Barlow (c.1626-1704). Though the title is inscribed in Latin, the keys are in both English and Dutch, emphasising the international nature of the print trade at this time. The king is attended by the figures of the Duke of York, the Duke of Albemarle, the Lord Chancellor, the Duke of Buckingham, the Duke of Ormond and the Captain of the Guard.